It was the opportunity to put this notion into practice that led to the formation in 1996 of the Secoya Survival Project, which I direct. Our work in Ecuador since then, particularly our collaboration in aquaculture with the Secoya, has been based on the idea that the combined resources of a traditional culture and modern scientists can find solutions that neither could alone. When the Secoya told us they were interested in fish farming, and had begun building fish ponds but were uncertain how to proceed, we agreed to work with them. Our belief was that the Secoya knowledge of local fish species, climate conditions, and their own dietary needs, joined to our consultants’ knowledge of hydrology, fish husbandry, and research techniques, would be a powerful combination for developing an aquaculture of native Amazonian fish. 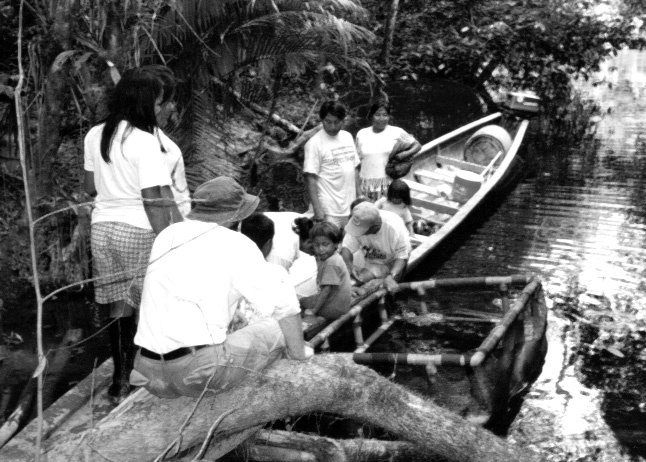 We also hoped that our Indigenous Aquaculture Initiative would benefit from two very different world views: the Secoya’s respect for the rainforest and tradition of living lightly on the land, and our scientifically based belief in the importance of preserving diversity and applying the precautionary principal to our own work. Since 1997, we have provided technical advice to the Secoya regarding pond construction; training in pond management, fish handling, and the like; and material aid ranging from PVC piping to fingerlings (baby fish) for stocking in ponds. The project has emphasized the importance of working only with native fish. This avoids the negative ecological consequences of introduced species, such as tilapia, the African cichlid. Also, Secoya knowledge of native fish enhances the project and local species better meet their cultural and dietary needs. We have actively discouraged the importation of aquaculture techniques involving the heavy use of purchased inputs such as cement or factory produced fish food. Now, some three years after we started, we need to ask how we are doing. Over 100 families, in the five participating Secoya and Siona villages, have built fish ponds and begun to farm fish. I never know the exact number because the project grows on its own, with families imitating their neighbors and cousins teaching cousins. While the Secoya have been stocking ponds with wild caught and nursery raised fish as the ponds became ready, just over a year ago we stocked some 50 ponds with the fruit eating fish, cachama (Colossoma macropomum). We now can evaluate not only social factors such as community interest and participation, but also technical questions such as pond stability and fish survival rates. Preliminary data from pond surveys and fish farmer interviews indicate that the project faces a number of challenges. First of all, we still have not eliminated pond failure due to poor siting or inadequate construction. A survey of 19 ponds in two villages found that 6 of them had their dams breached by heavy rains. Even among ponds that aren’t breached, the tough climate conditions of the Amazon are a challenge for our low tech approach to pond construction. It is a struggle to design an earthen pond that can both withstand heavy rains and retain enough water in the dry season. The work begins with identifying a site that has a continuous flow of water year round yet will not have excess water in the rainy season (or allows for diverting some of the heavy flow). Then it requires careful construction of a dam, with spillways to let excess flow pass and prevent erosion. One also needs to protect against seepage through the dam or pond floor in the summer months. If materials were made available only at the rate our consultants and local experts could evaluate sites and oversee pond construction, we certainly could do better. By expanding the project more slowly, we could more easily ensure that each pond is adequately constructed. However, scientific site evaluation requires a minimum of a year to determine high and low water flows. (In the Amazon rainforest, it isn’t unusual for what is a trickle of water in the dry season to rise a meter or two in a matter of hours when the rains come.) People have been understandably impatient to start. This is the other side of the rapid expansion coin. Individual families move ahead, making decisions based on training they have received, neighbors’ advice, and their own knowledge of seasonal shifts in hydrology. Often this works well; sometimes it fails. The approach may appear unscientific, but it responds to participant demands. One could argue that there are problems with this approach from a development perspective as well. Won’t people get discouraged if their hard work is not rewarded with good returns? Won’t they give up on a project where the technology appears to be flawed? These are important questions, especially given that dam failure isn’t the only obstacle we face. 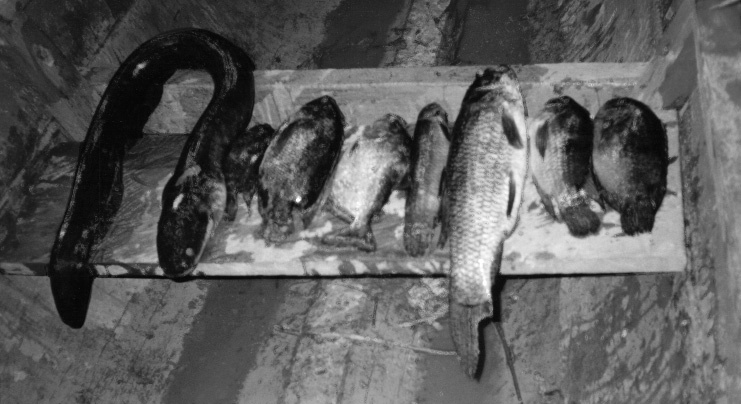 In the survey of 19 fish farmers mentioned above, we found that 9 of the 13 whose dams weren’t breached still had significant fish losses due to either pond drying in the summer or to excess flow in rainy months. 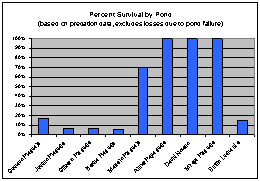 And, as the pie charts show, those fish that survived pond conditions suffered high rates of predation. Finally growth rates for the fish (fed primarily garden surplus and foods such as insects collected from the forest) were low: average weight for harvested fish was 1 pound, which is at the low end of expectations for cachama at one year of growth. As noted above, part of the explanation for less than ideal results can be explained by over-eager participants. On the other hand, many project shortcomings can easily be attributed to a project philosophy guided to a great extent by me, others in ISIS, and our team of consultants. Low growth rates could easily be addressed by introduction of commercial feeds, for example. Predation might be reduced by chemical sterilization of ponds. I think it is fair to say that many of project participants would welcome such "innovations" (really transfer of standard technology) rather than waiting to develop local solutions. In fact, the project balances on a delicate compromise between the immediate goals of families that want to quickly see farmed fish contributing to their diets, and the longer term goal of ensuring that the fish farming methodology we develop is sustainable economically, environmentally, and socially. The project could get better fish growth with commercial feeds but, in an economy where the majority of families still have no permanent cash income, it is unrealistic to think that aquaculture using this approach would be economically sustainable. Instead we are working with the Secoya to improve our use of local resources, with a goal of on-site production of a nutritionally balanced, easy to handle, feed. The predation problem also requires study and a local solution. Our immediate first response is cage culture of the smallest stages of the fish, when they are most vulnerable. This will prevent losses while we follow up on other observations. Initial evaluations of some of the ponds suggest that some of the predators, rather than being removed from the ponds, should be seen as a protein source in their own right, a locally available species that, under the right conditions, can be raised in aquaculture. The short term setback represented by the loss of many cachama may actually lead back to free local resources. Whether this hope will pan out remains to be seen, but it is a path to investigate. It is important to note that, however many challenges we face, the Secoya have already made important gains. They may not have eaten as many cachama in the last year as we had hoped, but many families did add this fish to their diet. Even with high losses described above, the cost per pound of harvested fish, based on total cost of all cachama purchased for 19 fish ponds, is less than half that of the cost for canned tuna fish, a typical purchase for a Secoya household that has no meat from hunting or fishing. If we eliminate from the equation the 6 ponds whose dams failed (making the assumption that this problem can and will be eliminated with some additional work and training) the cost drops to less than a third that of tuna. This means that, once the minimal, one-time cost of establishing a pond is met, the project can be maintained by the Secoya themselves even at the current levels of production. Obviously, this is only a start. Ultimately, the investment per pound of fish should drop to 5-10% of what tuna costs, as survival and growth improve. And the financial benefit is only part of the picture. Fresh cachama is highly preferable to canned tuna for reason of taste, nutrition, and its role in traditional dishes. Also, recovering food self-sufficiency is an important part of maintaining Secoya culture. Of course, there are non-cash costs to aquaculture as well: labor, and the local foods. One of the concepts behind the project is that it should tap the rich local resources available; if used sustainably these are free to the local people. As far as labor goes, we actually are working to increase that input significantly. Currently many families practice a very non-intensive approach to aquaculture, often visiting their ponds less than once a day. This fits well with the diversified traditional economy, and Secoya reliance on natural resources, but it also is an important part of the explanation for low yield--which leads to a comparison of results by family. Another positive aspect of our preliminary results is the range of success of the Secoya fish farmers. 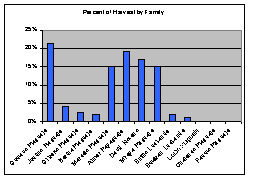 As the bar graph shows, of the thirteen families we have been looking at, five harvested 87% of the total take of fish from all the ponds. Another five families harvested the remaining 13%, and three families harvested nothing. If this were to be the permanent state of things, the inequality clearly would not be a good thing. However, for a project trying to improve technologies this is an excellent indication that current methodologies do have the potential to yield significantly better results than project averages show. 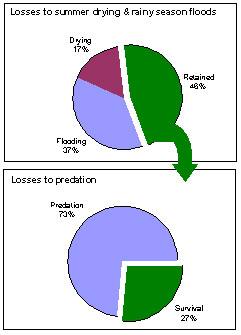 Predation impact was also widely skewed, with some ponds showing extremely high rates and others no significant predation. Clearly there is a lot of opportunity to improve the project by identifying best practices among our own aquaculturists. But the benefits of the wide ranging results go beyond the opportunity for more successful ponds to serve as a model for the others. In complex systems experiments such as ours, with many variables, the variety of outcomes makes it easier to parse out the importance of different factors. Our "experiment" is not one where we can eliminate variables to address them one at a time. Instead of a set of replicate fish ponds, we have some hundred families each hoping to maximize benefits from their own fish pond. We need to look now at differences in everything from pond conditions to each family’s management practices to understand and improve on the results we are seeing. This is where the many ponds come in. The project has allowed the Secoya to build lots of ponds and some have failed. Why is this good? Because now we have more than one hundred sets of results to study and more than one hundred fish farmers observing and analyzing the results. And, each time we get something right, one hundred families will be experts who know why it is right. As experts, they will be capable of responding to future problems. All this is not to say that there aren’t problems or a need to adjust our approach. One conclusion is that our attempts to provide technical assistance to as many people as possible may be spreading our technical advisors too thin. It may be time to focus on working closely with a smaller group of the established Secoya fish farmers, the "community innovators" who initiated the project, to identify the best solutions to common problems. Perhaps our community of fish-farmer scientists can’t or shouldn’t include all project participants. ("Community" is a term whose meaning we sometimes debate at ISIS; here I use it to refer to those who are collaborating to answer the many questions related to designing Amazonian aquaculture). Those who don’t want to put the effort into experimenting, who would rather simply apply a proven technology, have that right. But rather than importing an inappropriate technology, we would rather support local innovators in developing an indigenous technology that can then be transferred to their more cautious neighbors. In the process, we challenge the all-too-common preconception in so many communities that scientists and other experts have all the answers. It may appear that Science for Survival represents little more than a participatory approach to solving technical questions related to fish survival. As discussed above, the participatory approach to solving technical problems is an important piece of it, but it doesn’t end there. The concept has important implications for cultural survival as well. Blending traditional knowledge with modern science widens our concept of what makes our project successful and our methods appropriate. Aquaculture is judged not just in terms of how much protein it produces but also how it contributes to survival of cultural traditions; not just how quickly the fish grow but also how well fish management practices fit into Secoya daily life. One recent opportunity to look at such issues was a fish collecting trip to the Cuyabeno Wildlife Reserve to the north of Secoya territory. The reserve includes flood zone lakes, whose water levels and fish populations rise and fall with seasonal rains. They were a traditional fishing area for the Secoya and other indigenous groups in the region long before the Reserve was created. The rich and diverse community of fishes includes many that are excellent candidates for aquaculture. Secoya families collect fish for their fish ponds and store them in a floating cage. In October, the project obtained permission from the Ministry of the Environment to organize a fishing trip to the Cuyabeno to collect wild fish to bring back to stock in Secoya fish ponds. A group of 30 people from two villages traveled to the lakes in two motorized dugout canoes and spent two days there fishing and collecting fish to bring back to their aquaculture ponds. 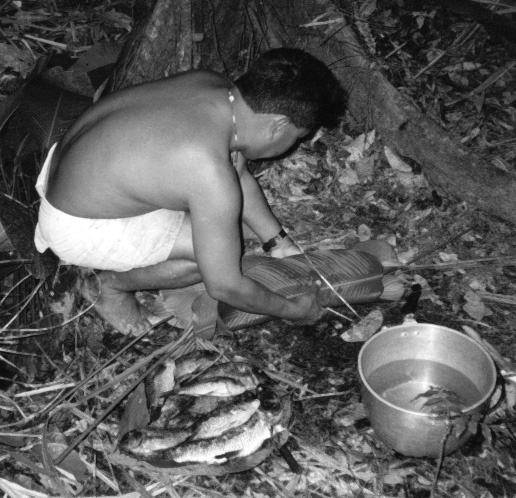 While collecting fish for their ponds, the Secoya cooked and ate together. They also used the opportunity to take home a large catch of smoked fish for later use. As one of our consultants reported, fish weren’t all that was caught. The Secoya participants were also recapturing some of their traditional customs that are not commonly seen nowadays in Secoya territory. For example, families bathed together in the river at the end of the day and then cooked and ate communally rather than in nuclear families. The next morning, the women expressed joy at the good catch by putting on their best clothes and painting their faces. The entire experience allowed the participating families to give new purpose to a traditional practice, the seasonal fishing expedition, that is becoming less common due to a combination of factors ranging from loss of traditional territory to introduction of new economic activities. Of course, the blending of science and traditional knowledge involves a two-way flow. We challenge scientists to look at and learn from traditional practices but we expect them to do this with a critical eye. Another consultant saw another aspect to the fishing trip which he described as a trip to the supermarket. He was concerned that the large catch from two days of fishing by experts (women, men, and children demonstrated equal skill) could have an excessive impact on the site where the fish were collected. This observation challenges the assumption that, just because indigenous populations have not destroyed the environment in the way modern society has, their activities are necessarily ecologically benign. The lakes, rivers and forests are the supermarket for rain forest peoples, but long term hunting pressures by indigenous communities can sometimes change species make-up. Now, with rapid population growth--due to immigration into the rainforest by Ecuadorians from the coast and the Sierra--local resources are being shared by more and more people. Even though similar fishing parties were possible in the past, their relative impact may be greater now in an area that has suffered impacts ranging from oil spills to deforestation. Stocking the larder the traditional way: is this sustainable in modern times? This is, of course, one of the driving forces behind developing indigenous aquaculture in the first place: to increase food supply while reducing pressure on diminishing wild stocks. The challenge for the project is to evaluate the impacts of traditional fishing practices to determine under what conditions they can be safely used to stock ponds. Science for Survival offers a chance to use both modern and traditional criteria to evaluate our methods as well as our results.